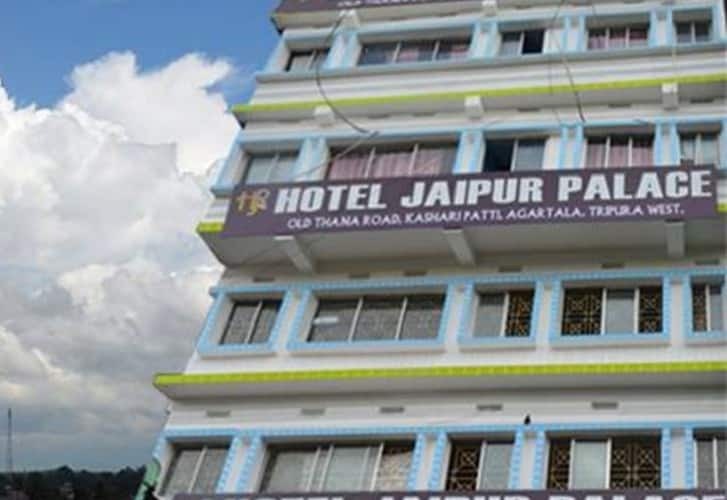 Jaipur Palace is a 2 star hotel in Agartala which offers free internet access. This property is located 6 Km from Agartala Railway Station and 2 Km from Lotus Temple This hotel in Agartala consists of 26 rooms spread across 2 floors. Each room offers amenities like bottled water, telephone, television, room heater, wardrobe and an attached bathroom with toiletries. Additional facilities available at the property include room service, front desk, laundry, luggage storage, parking,backup generator and medical services. The hotel in Agartala also features a separate vegetarian and non-vegetarian kitchen for the convenience of the guest. Hotel Jaipur Palace also arranges for airport transportation. The property lies from 10 Km Agartala Airport and from 3 Km from Nagerjala Bus Station. Full refund if you cancel this booking by 29-Mar-19 12:00 PM IST. First night cost (including taxes & service charge) will be charged if you cancel this booking later than 29-Mar-19 12:00 PM IST. What's Good: only the room service is good. other than that room condition, lights, walls, bed sheet, blankets. everything was pathetic. They were smelly and dirty. Need to ask them to change the bed sheet otherwise they won't bother. I even found dead cockroach in the room lying in front of the bed. As I paid around 1200 per night. I dont want the room to be bigger but atleast a hygienic room would have satisfied me. Reason For Rating : Rooms need to be cleaned, walls are quite dirty, rooms service is god no doubt. blanket , bedsheets are dirty, lights are not properly installed in room. Reason For Rating : Yatra has done everything properly. But, the Hotel needs lot of renovation. The property is located close to city centre, but not in a very good place. However, the staff are very helpful. What's Good: very good location. most of the places to visit are at walking distance such as rajbari, jaganth and laxmi narain bari, rabonder bhawan and different malls. What needs to improve : in addition to bengali food, north indian food was availbe at reasonable rate. alloo prontha and chhole ki subji and maggi was liked by our group very much. What's Good: hotel was near to rajbari, jaganatth and laxminarain bari. What needs to improve : quite near to motor stand. North indian food as well as bengali food avaolable. Location is center of Agartala, near laxmi narayan temple. 15 mins walk to jagannath mandir and ujjyanta palace. But room are untidy, especially the sheets. Prices per room are epensive. Auto stand is nearby for city tours. I stayed at Hotel Jaipur Palace in Agartala for three nights. The hotel is centrally located and a short walk from the motor stand, but that is about all. I booked it through GoIbibo and the rooms were terrible, the bathrooms unclean which has been my experience in both the hotels I stayed in Agartala. The hotel is itself located next to sewage drain. One of the staff at this hotel was creepy and as a solo woman traveler it did not make me feel particularly safe. He would appear bare chested and also asked me several questions about where I am from. I think it was perhaps the novelty of having a solo woman traveler check in and he just did a bad job of expressing his curiosity, but it made me a little nervous. The room is not that big, but quite spacious for two people! The staff is very cooperative and friendly. Dinner and menu breakfast was also good . Though there was only vegetarian food during my two-day stay in the hotel, food was very good. I highly recommend this place! You won't be disappointed!